Hi all......I think I will be going to a raised bed garden next year. I'm tired of battling this NC clay soil. I will be building my own raised beds but I'm not sure how deep my soil should be. I will be growing most of the usual veggies. Would 8-10 inches of soil be enough or should I go deeper? Also, can I grow berries (blackberries, rasberries etc.) in a raised bed? You can grow everything you like in those beds including fruit bushes and berries..that should work well. You can grow pretty much anything in a raised bed. I have some on concrete that are 2' deep. If you are building them on soil, 1 foot should be plenty. Just break up the clay with a fork a little bit first, making some holes down into it, before filling the bed. That will facilitate roots and earthworms, etc being able to get into the clay and help with drainage. My husband did three raised beds for me, this is only my second year with them. I love them - he used untreated wood, did them 8 inches and put linseed oil on them. The only down side - they are starting to decay already, probably from the hot humid weather here is Florida. They drain fantastic, all plants in the bed do much better then pots and ground. I personally would go another 2" - I can't give you a reason other then I think it would be just better for the root system for some things, no science behind my reason, but when we do replace them I am going alittle deeper. I am not sure what I will do when I replace them, as I do not want to do this too often as it is costly, I will start looking into other materials soon. Let us know what you decide, I love other people ideas. maybe post some pictures before you fll them up. The last time I did raised beds, I did them out of 1" x 12" boards. Even though I used angle braces on the corners and everything, they decayed/ fell apart within just a few years. The beds I have now I made from stacked 4" x 4" fence posts held together with steel rebar. It's treated wood (which I do not believe is any problem these days) which I put wood sealer on. They have lasted 9 years now and are doing great. Thanks everyone for your help, I should be done by the spring and will be sure to post some pics. 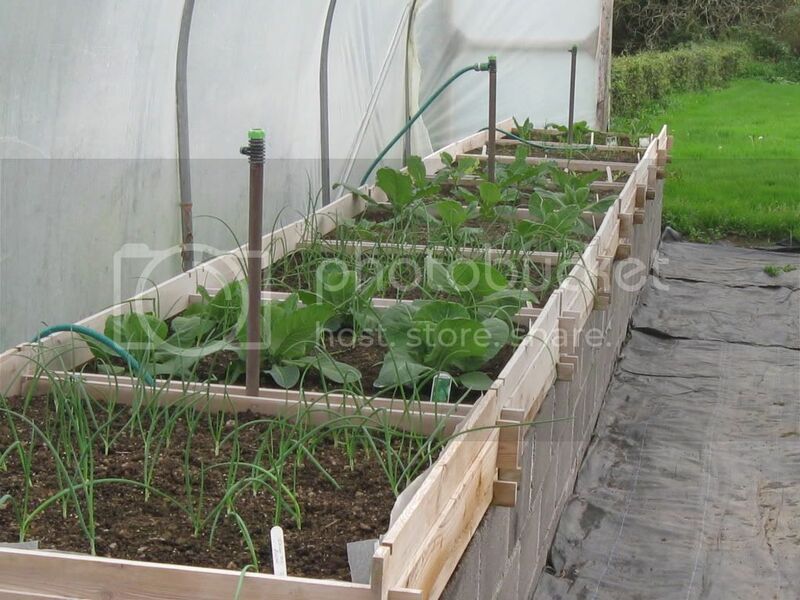 I would put your raised beds on your existing soil without any barrier. In this way the roots can go down into the soil beneath the beds. Most plants will send roots quite deep, and yes even into compacted clay. Clay is good to hold water and minerals and your plants will benefit from having those layers available. Fill your beds with some easier to work soil 8 inches deep and you will do well. I think one could make some very long lasting beds with cinder blocks. If you filled the voids with concrete mix they should stay put and never rot. I got a bad back so I got this built...it's got about 7 or 8 inches of soil. If you click on the picture to enlarge it, you will see more clearly what Liam is talking about. 7 or 8 " of soil in the wooden beds, on top of a cement block foundation, just to raise the beds to a more comfortable level. It's a great idea for people that have difficulty working at ground level, but I would have built the soil beds deeper. Since they are sitting on the cement block, plants can't root down through the bed into natural soil. That's why I built the ones I have on concrete 2' deep (I did have to have a truck load of soil hauled in to fill them, a cubic yard each.) What Liam has should work for things like lettuce, but would not do for growing tomatoes and peppers in. When I start a new bed I set it on about 6 inches of leaes or straw or put composted soil at the bottom! If you have some old brick put the 4by 4's on a row of brick to make it deeper. A few inches of sand , pea gravel or a mix of sand and dirt at the very bottom works great for drainage! You may even want to dig out a small 6 inch hole the size of the raised bed strain it & mix it with sand and compost or even leaves and put the mix back in the bottom! Now you know what you bottom of the bed contains and will drain good and llow the roots to get deeper! Take the extra time its worth it for years of nice crops! Some people disagree with me about using the raised bed as a cold frame but it works great. All you have to do is find some old windows and put them so they are about 6 inches to a foot aove the frame itself and eal the area so it keeps in the heat for a few extended months into the late fall or early spring! I just make a frame the size of the raised bed with furring strips and rap a double layer of 3 mill plastic around the frame and staple it on and use it all year for different things besides the cover of the raised bed! Only the very edge of the bed is sitting on the concrete block...it's like 2 long walls with a 3 ft space between. What I have done is made beds you see in the photo in such a way that they fit onto one another so you can have them 2 or 3 high to facilitate growing more deep rooted plants...works great for carrots..parsnips...swedes. tomatoes..I grew pototoes last year..worked out very well...single boxes I use for lettuce ..cabbages..cauliflower and broccoli..onions etc. Big advantage is that the weeds don't take over and the snails don't climb up that high. Liam, I have a bad back too. What a great idea to raise your raised beds ! DeborahL wrote: Liam, I have a bad back too. What a great idea to raise your raised beds ! Deborah ..I'm really enjoying gardening now..I had a back operation some years ago and so bending was becoming almost impossible..this way everything is waist high and I can even walk around the beds to save stretching. I decided to go with concrete blocks because I reckon no matter how well treated timber is it will rot eventually....would recommend it highly to anyone who has a problem with the back. My raised beds are made from wood taken from discarded wooden pallets, primarily spruce and pine. I've been reluctant to use treated wood, although it would probably be fine, so I'm forced to endure continual replacement of rotted wood. In a warmer clime, this might not work because the wood would decay even faster but, in Vermont, it works well enough so that I only have to replace boards every three or four years.